It has been raining all day, heavy at times. A remedy for that is the following shots taken in Acadia National Park only three weeks ago. It was cloudy and rainy too, but autumn colors were still vivid, and there were some interesting boulders. View from top of South Bubble. The famous rock on top of South Bubble mountain. Another boulder near the above one. Another boulder in the same area of South Bubble mountain. 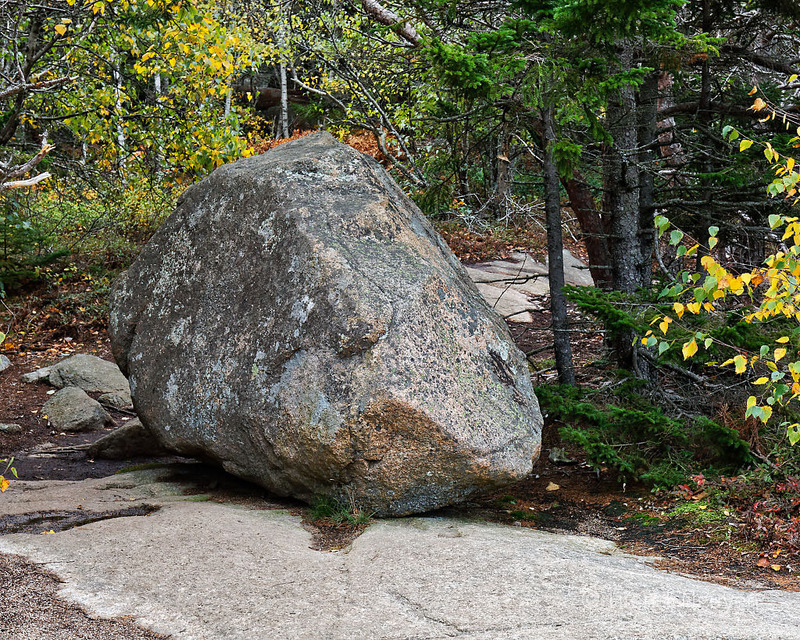 Big boulder near Pretty Marsh Picnic Area in Acadia National Park. 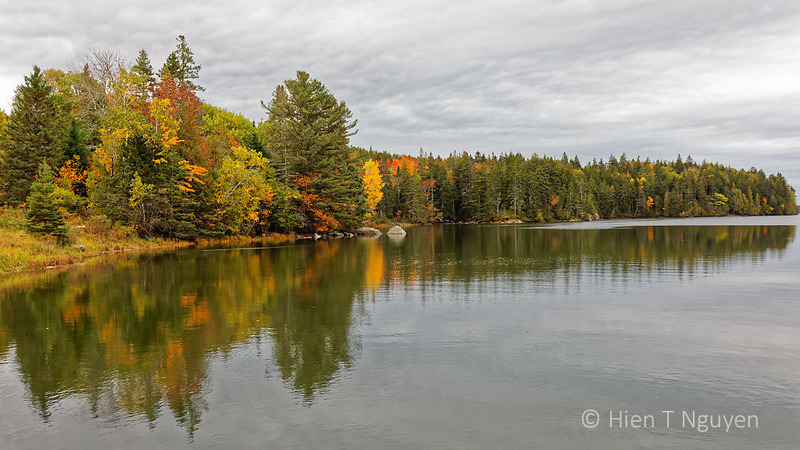 Autumn scene near Bass Harbor, ME. Thank you for this stunning visit to Acadia. I, too, have a reverence for beautiful boulders, and your photos of them are lovely. And of course the tree-changing colors are magnificent, too. Thank you very much, Jet! I was just in awe with Acadia, and wished I had been there many years ago. 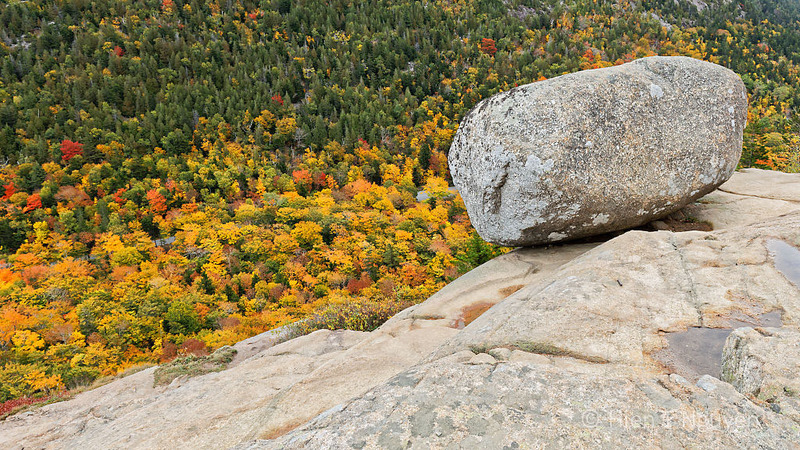 I loved both the fall foliage and boulder images in this post! I often refer to Michigan as the Gravel State, as the lower peninsula where I live is mostly a glacier moraine deposited here at the end of the last ice age. We have very few rocky areas or large boulders such as these in your images, which take me back to times when I’ve visited mountainous areas that I love so much. Maybe you were not early. 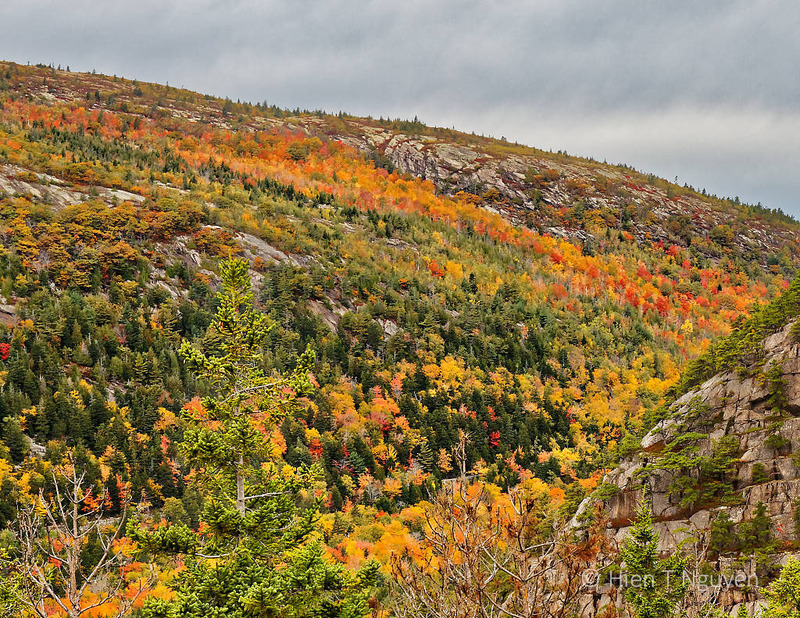 This year fall colors have been disappointing from the Midlantic states to the South. Nothing like nature’s paintbrush to brighten our days. Gorgeous images. Thanks Sue! Nature is the best artist. Your rainy day project is fun. 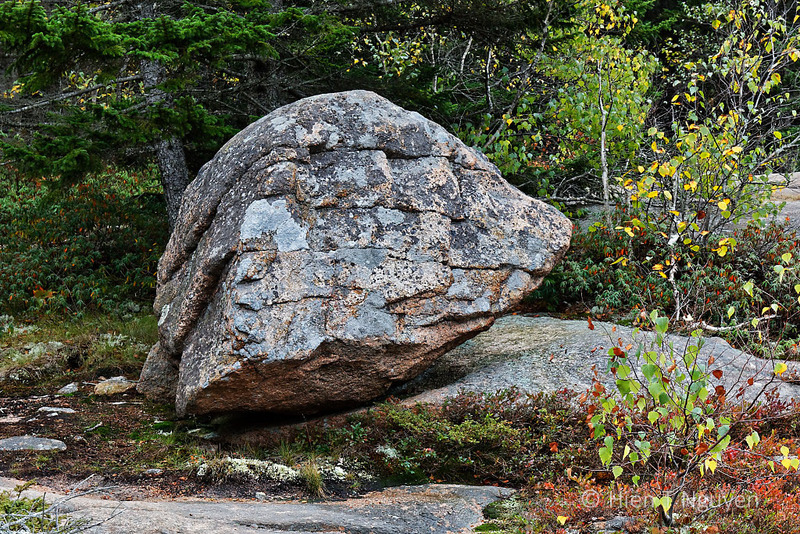 I love rocks, and the east coast has so many nicely rounded boulders. My favorite here is the one near Pretty Marsh – I like the way you composed the picture with the rock and the tree. And the colors are wonderful in all of them, whether they’re fall foliage or subtle grays. Thank you Lynn! This was indeed a very good rainy day project for me. Acadia was very photogenic, especially with its fall colors. Glad you enjoy these photos, Diana! Such stunning colours! And those fascinating boulders look as though they’ve been moved around by giants. Celia, Acadia National Park is a great place for those interested in geology. Volcanic eruptions and glaciers have left an incredible landscape which is not too difficult to explore. That does sound pretty spectacular! I never used to be too interested in geology, but the more I learn, the more fascinating I find it. Lots of rain here in Wales too, my favourite boulder is the big one next to the tree. Very satisfying. That big one could be a menhir! Now that’s a word you don’t hear too often! Gorgeous, they brightened my evening! Glad you like these, Donna! Those beautiful colours are in such stark contrast to the rugged boulders! It’s amazing that so much vegetation has grown up on all those glacial mountains and rocks. These are beautiful, Hien. 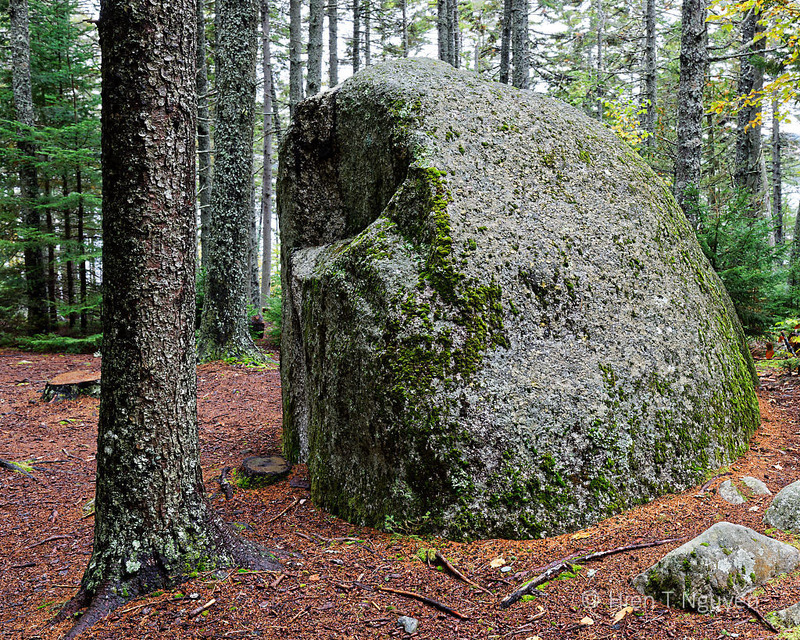 Our area has a lot of glacial erratics, often which we come upon in the forest. Over millennia our waterfall split a big one into several pieces! Thank you Eliza! Glacial boulders must be very handsome also where you live.